This is going to be the best aging meeting of all times. 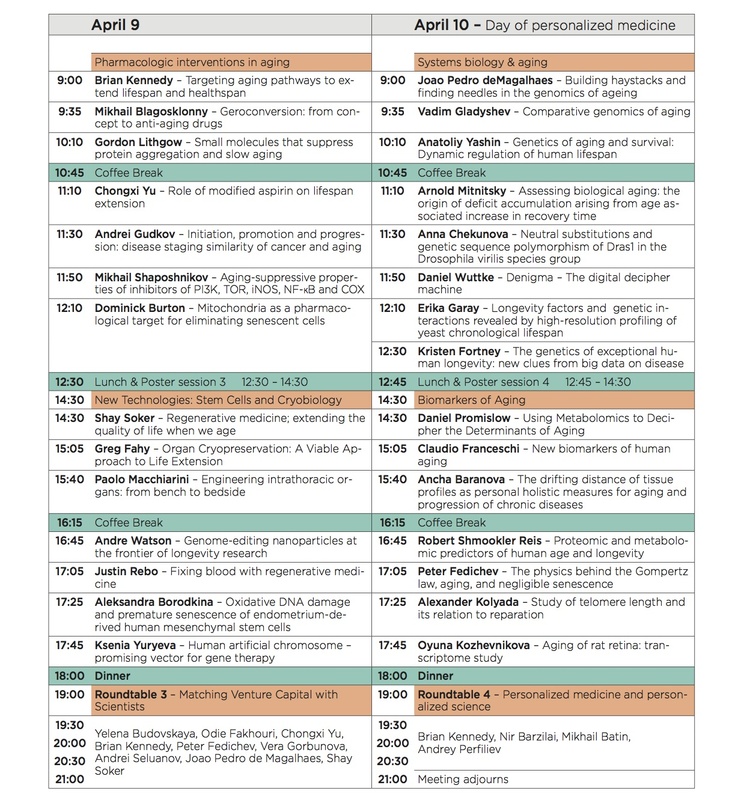 The program speaks for itself, but I’d like to draw your attention to the round tables in the end of each day. The first two are on the theories of aging. We will have a science battle – register for the conference and learn which theory will win! Insanely interesting is the round table on commercial projects – where the most prominent scientists will present their startups in the area of fighting aging and age-related diseases. My favorite is the personalized science round table where a great selection of experts will discuss the utmost importance of health monitoring, biomarkers of aging, health and diseases and also the solutions – existing and those that need to be developed to monitor our health and prevent the diseases from manifesting at a very early stage. Sooner or later the human life extension problem, the task of achieving immortality will become the main issue of government policies in developed countries of the world. This will happen on its own because of the exponential growth of technologies. At some point of time immortality will become the main political question. Nevertheless, let’s make this process faster to save millions of lives. In order to make this leap towards human radical life extension, political will is needed. Without it there is no money for new research, no laws permitting the most radical experiments (cloning and transplanting a mammal’s head), there is no fast approval of new therapeutics. There is no proper interest. We consider the gay community fighting for anti-AIDS drugs development against FDA an excellent example of political struggle. It is pictured in the How to survive the plague movie and its trailer. Here we see the main signs of successful political struggle – large amounts of people uniting, heating of emotions, street actions, using speech, music, slogans and any other features. Vigor in being ready to fight for the right to live. This is a spectacular example to follow. A call for action to fight for lifespan increase. The majority of transhumanist efforts were dedicated to trying to persuade the billionaires. At large, this strategy failed. Billionaires are billionaires because they love money more than their own lives. The major result here is Google creating Calico company. Calico’s budget was announced to be several hundreds of million dollars. However, it is still unclear what Calico will be doing. The research plan wasn’t shared with the public. There are several reasons why persuading the billionaires failed – their preoccupation with immediate return, their religious beliefs (Steve Jobs), their irrationality and so on. Therefore, there are only two possible addressees of our message – the government and the people. In a democratic state the policy is defined by the people’s choice, and because of this crowd activity is particularly necessary to influence the state. Moreover, the people can substitute the state. For example, back in the day the government gathered taxes from the people and spent them on various projects, but now the people can do the very same thing using crowdfunding and substitute the government. Although, perhaps, in the future we will see transhumanist parties in parliaments. Various public actions can influence government policy. It is our task to prepare actions in favor of life extension. An idea acquired by the masses is material, Lenin wrote. If a given idea has 20 million followers, it doesn’t need a state to win. It has already won. It can form an alternative system of decision making on the Internet, i.e. create the crowd-power. Radical life extension is the strongest idea in the history of mankind. The Pirate party and the Green party may serve as an example of how the international life extension party will be created. First of all, there has to be a circle of people who share the same value, and separate flamboyant actions that highlight this value. Just like Greenpeace performed this action when they sailed to the island where the nuclear testing was about to take place. However we are aware that radical life extension idea still hasn’t got enough followers, and public actions are needed to attract new supporters, because actionism is also quite fascinating. Maybe we should float 400 coffins into the Hudson River so that people will see with their own eyes how many people die in New York every day. Another way of using the power of the crowd is crowdfunding of scientific experiments. And it’s important to say that there are such experiments that possess the power of political acts, meaning they extend the limits of what’s possible and set the direction of further movement. It so happens when the first step in some activity sets the direction, for example when a person gets admitted to university for particular major, this defines his movement on the professional ladder – whether he will become an economist or a dentist, a marine or an AI developer. Yes, options are possible, but the first actions triggers the following ones. We have to find exactly this kind of solutions in our field. For example, transplanting a head from one mammal to another will become the discovery of the whole area of research, but right now this procedure is not permitted because of the pseudoethical beliefs in the majority of the countries in the world. Today the most obscurant people with cave world view bloviate about bioethics. What kind of experiments are those? One of the main arguments against cryonics is that it’s unclear whether the memory of the person will survive the freezing. However, it is well known that nematode worms survive the freezing in liquid nitrogen quite well, meaning separate neurons can survive the freezing. The question is if we teach the worm do something and cryopreserve it, will the acquired memory be intact after we warm it up? If so, then we will be able to do this experiment in more complicated organisms. If not, then… we still should move to more complicated models and study the requirements for memory preserving. If we are able to do aging diagnostics, we will be able to measure the efficacy of anti-aging drugs much faster than watching whole generations of humans age, meaning we will see the effects within our lifetime. This is how aging will stop being a black box and will become a quantitative and changeable parameter. Testing various substances and therapies on longevity will stop being some shaman magic and will gain solid scientific basis. Drug development will become very rapid and significant human life extension will be achieved. We can use genetic vectors and other technologies to insert various genes associated with longevity in adult mice, and we can select the combinations of those genes that will significantly increase lifespan. This will pave the way to creating human longevity genetic engineering. Let’s do those things to a rat that make the naked mole rat negligibly senescent. This experiment will illustrate the potential of therapeutic cloning and will open new opportunities in regenerative medicine. If we are able to sustain viability of a head outside the body, this will open up the new possibility for extending life in terminally ill people, including the transition to using the completely artificial body. It we are able to simulate the operations of the 300 neurons of the nematode and reconstruct its behavior, then we will prove the sufficiency of our knowledge for more complicated objects. AI can become a powerful player in healthcare – if we have the detailed information about our health, we will be able to easily prevent any kind of disorders on very early stages of their development. By doing so we will significantly reduce the risk of death. In the end AI will not only act as a physician, but it will also conduct scientific experiments and will guarantee human life, health and immortality. First of all, crowdfunding of basic scientific research. There is a new service that would connect the public and medical research – LabCures. It will allow everyone to fund whichever research in life-sciences that they like. Secondly, we propose to join the Longevity Party group on Facebook and use this resource for organizing street actions, demonstrations, graffiti and so on. 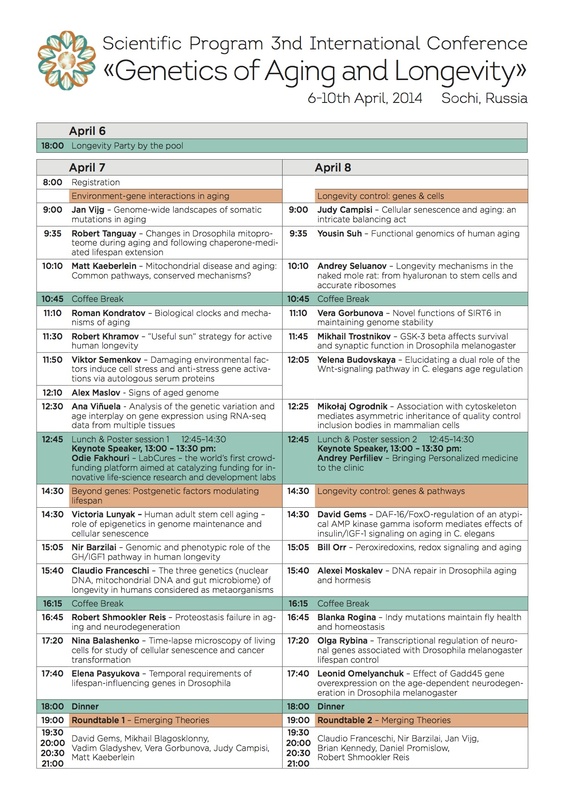 Thirdly, I invite everyone to come to our Genetics of Aging and Longevity conference in Sochi on April 6-10, 2014. The world’s leading aging researchers will gather there to discuss the latest research highlights in the field of life extension. We will be very happy to see volunteers on our conference.